In the Heim booth, a before/after remanufactured press and a battery of other services will be displayed. The Chicago, IL company maintains a considerable inventory of remanufactured presses, plus offers the ability to retrofit or rebuild any Heim, Rousselle or select other brands of presses. 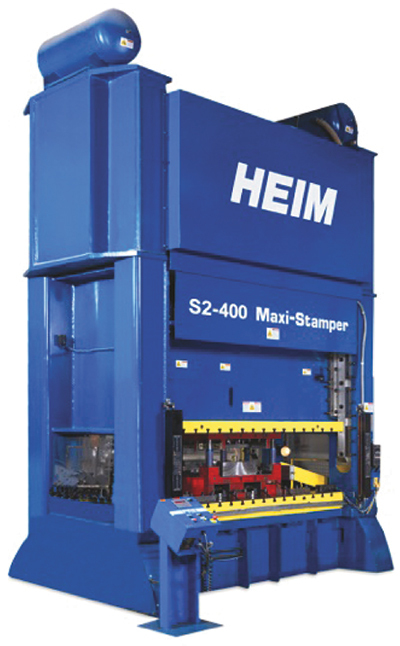 Heim engineers its Maxi-Stamper (shown) straightside press with the latest CAD technology. The eccentric-geared tie-rod are available from 300 to 1000 tons, with user-specified stroke, speed, shut height and bed area. Standard drive rating is ½ in. above bottom stroke, but other options are available. Smaller press requirements are served by the Maxi-Stamper II C-frame, front-to-back shaft designed presses from 90 to 300 tons.